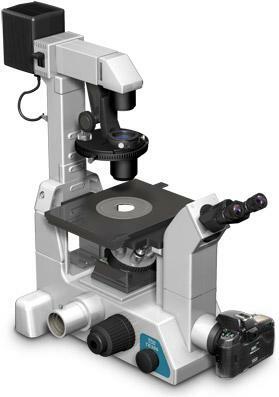 The Eclipse TE300 is the advanced research model with a sophisticated 4-way image path control. Research applications often require multiple detectors for video, photometry and 35mm photography. The TE300 offers a 4-way optical path control. The standard illumination pillar features a pre-centered 12V 100W camphouse, a removable and focusable centering condenser mount, mounting for micromanipulators, and a tilt-back feature.